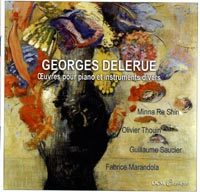 GEORGES DELERUE (1925-1992): Antienne I and Concerto de l'Adieu for Violin and Piano, Violin Sonata, Stances and Aria et Final for Cello and Piano, 4 Mouvements for Percussion and Piano. Description: This second disc of the film composer's concert music brings a gritty and emotional violin sonata from 1977, an unusual percussion/piano suite from 1953 which might make you think of Lou Harrison once or twice, an early (1947) work for cello and piano whose finale pays tribute to his teacher Milhaud, while the Concerto is an 11-minute adaptation of music from a 1992 film with a prominent violin part. Minna Re Shin (piano), Oliver Thouin (violin), Guillaume Saucier (cello), Fabrice Marandola (percussion).